This research satellite would eventually provide a stable point in the sky to reflect pulses of laser light. 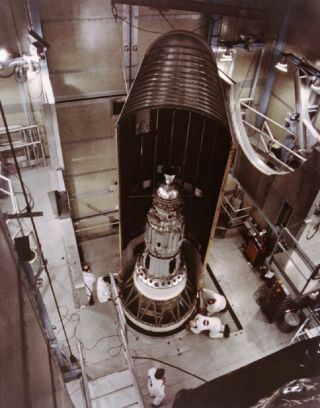 In this historical photo from the U.S. space agency, Goddard's geophysics research satellite, a 906-lb. (411-kg) satellite that looked more like a dimpled cosmic golf ball, is inside the nose cone of this Delta rocket. The spacecraft, which NASA launched from the Western Test Range in California in 1976, provided a stable point in the sky to reflect pulses of laser light. By timing the return of the laser beam to an accuracy of about one ten-billionth of a second, scientists expected to measure the relative location of participating ground stations within one inch or a few centimeters. These measurements allowed scientists to track and analyze tectonic plate movement and continental drift. The spacecraft, called the LAser GEOdynamics Satellite (LAGEOS), was the precursor to the current-day Global Positioning System (GPS) system operated by the Defense Department.